Chicago Edge Ensemble is an all-terrain vehicle, a quintet equally capable of negotiating the bumpity-smooth contours of swinging postbop, the banked hairpin turns of fusion-funk, the fog and ether of AACM-style intrigue and the tumultuous thicket that awaits if you gleefully careen off the road. Leader-guitarist Dan Phillips writes segmented songs that frequently include at least two or three of those scenarios in succession. Although he left the Windy City to teach in Thailand in 2001, Phillips has retained impeccable contacts that allowed him to recruit drummer Hamid Drake beside his longtime bassist Krzysztof Pabian in the rhythm section, and the ex-Vandermark 5 horn duo of trombonist Jeb Bishop and saxophonist Mars Williams. All seven songs, Phillips originals, are restless explorations. Take the title track, which opens with bowed bass, cymbal taps and delicate electric guitar before the drowsy horns enter in unison. Riffs glance off each other in a meandering fashion before Phillips introduces a vamp, Drake answers in the pocket, Bishop goes brawny to engage the drummer for a while, and Phillips’ weepy guitar signals another change—and we’re only halfway through the 11-minute tune. The titles “Bluster Buster” and “Splatter Pattern” infer that someone—usually Williams—is going to be shredding, but that’s just one of many events in each song. “Bipolar Vortex” leads with chromatic drones that evolve into feisty squabbles, then parade-march funk, back to squabbles, into full-blown sax-guitar spasms and back to drones. And “Uptown Swagger” could be the work of a classic fusion-rock trio until the horns enter and spin it into campy funk. This is music that animates your solar plexus, the soles of your feet and, not least, your soul. 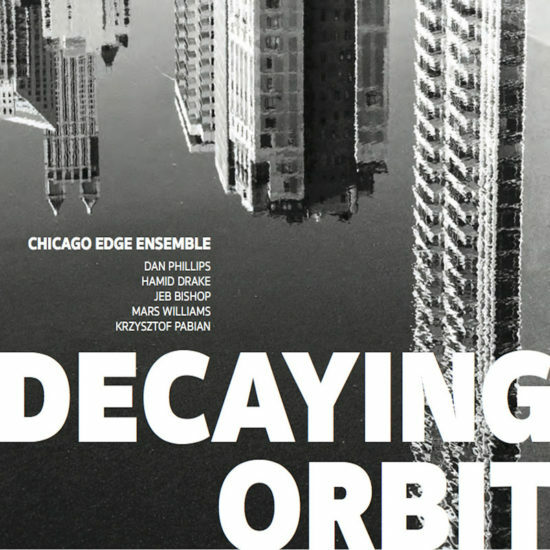 Preview, buy or download songs from the album Decaying Orbit (Music +) by the Chicago Edge Ensemble on iTunes.